HP 6730b CTO-XL#ABD 15,4'' WXGA T9400-2,53GHz 4GB 320GB DVDRW X4500HD *WinXP-Pro* 1J.Gar. LIFEBOOK C1410-05DE 15,4'' WXGA T7200 512MB 80GB DVDRW WL VistaBus. 2J.Gar. 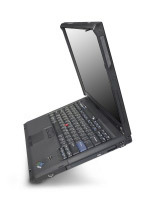 Thinkpad T61 NI05BGE 15,4" WXGA T7300-2,0 1GB 80GB combo FP abg XP-Prof. 3J.Gar.